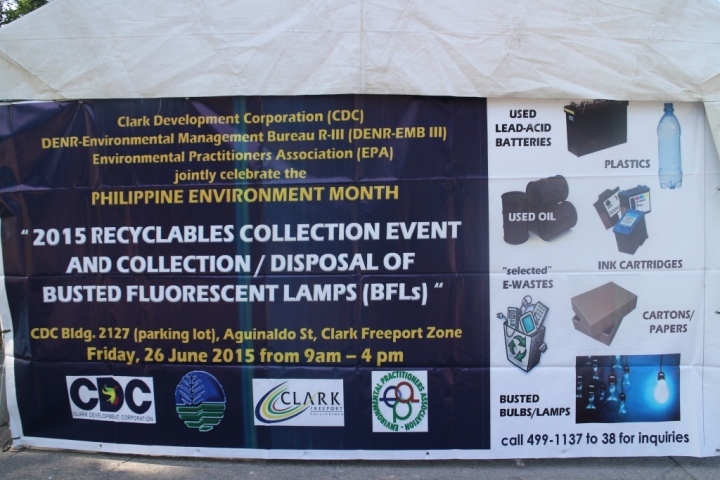 In celebration of Philippine Environment Month, Clark Development Corporation once again held its annual Recyclables Collection Event last June 26, 2015. In coordination with the Department of Environment and Naturals Resources (DENR) Region III, the Environmental Management Bureau (EMB) Region III and the Environmental Practitioners Association (EPA), the event was held the CDC Parking Lot, Clark Freeport Zone, Clark Field, Angeles City, Pampanga. Such is also the goal of Bantay Kalikasan, a program of ABS-CBN Lingkod Kapamilya Foundation, Inc. With its Bantay Baterya Project, proper handling, transport, recycling and disposal of used lead acid batteries has been its endeavour since its inception in 2000. In partnership with Oriental and Motolite Marketing Corporation, the project is a nationwide campaign that solicits the support of companies and individuals to donate their used lead acid batteries to the foundation. During the event, Phoenix Semiconductor Philippines Corp. (PSPC) showed its support by donating a portion of their batteries to the Bantay Baterya Project. Representing PSPC, Ms. Daisy Malig - EHS Manager, turned over the batteries to the project. The revenue from this donation goes to Bantay Kalikasan's environmental projects such as the protection of the La Mesa Watershed and preservation of key-biodiversity areas of the country through the promotion of eco-tourism.